His was the first truly imperial power in the West since the fall of Rome. These mayors of the palace took over the Frankish empire and became more active monarchs. Mayor Charles Martel was the illegitimate son of the Mayor Pippin of Heristal, who himself was the son of a Mayor Ansegisel and his wife, Saint Begga. It is through the fathers of Ansegisel and Begga, Saint Arnulf of Metz, and Pippin of Landen, respectively, that Martel’s dynasty received its name, that of Arnulfings or Pippinids. Martel died before he could place a new puppet king on the throne and he was succeeded by his son Pippin the Short, the father of Charlemagne. Pippin promptly placed a puppet on the throne and refusing to play any part in such a charade as his father’s; he called for the pope, Pope Zachary, to give the man with the royal power the royal title. This the pope did and Pippin was crowned and consecrated king of the Franks in 751 C.E. As a consequence of this, Pippin’s eldest son, Charlemagne, immediately became heir to the great realm which already covered most of western and central Europe. It was not the old name of Pippin of Landen or Ansegisel that was to be immortalized, however. Called the Carolingian Dynasty from his Latin name, Carolus, the new dynasty spread to encompass an area including most of Western Europe and, through various treaties and divisions of property, laid the groundwork for the French and German states. Charlemagne’s birthday was believed to be April 2, 742; however several factors led to reconsideration of this traditional date. First, the year 742 was calculated from his age given at death, rather than attestation within primary sources. Another date is given in the Annales Petarienses, April 1, 747C.E. In that year, April 1 is Easter. The birth of an Emperor on Easter is a coincidence likely to provoke comment, but there is no such comment documented in 747 C.E., leading some to suspect that the Easter birthday was a pious fiction concocted as a way of honoring the Emperor. Other commentators weighing the primary records have suggested that the birth was one year later, 748 C.E. At present, it is impossible to be certain of the date of the birth of Charlemagne. 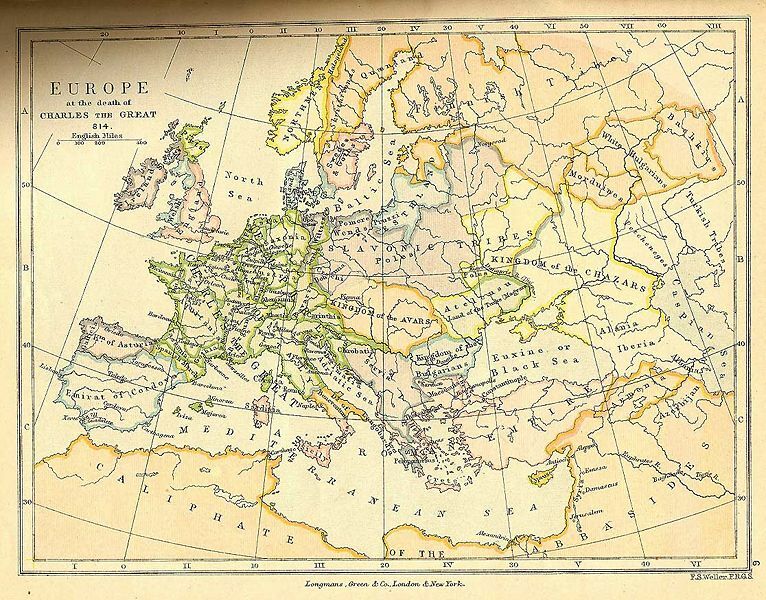 The best guesses include April 1, 747 C.E., after April 15, 747 C.E., or April 1, 748 C.E., probably in Herstal or Jupille (where his father was born), both close to Liège, in Belgium, the region from which both the Meroving and Caroling families originate. Other cities have been suggested, including Prüm, Düren, or Aachen. The Roman tradition of realistic personal portraiture was in complete eclipse at this time, where individual traits were submerged in iconic type castings. Charlemagne, as an ideal ruler, ought to be portrayed in the corresponding fashion, any contemporary would have assumed. 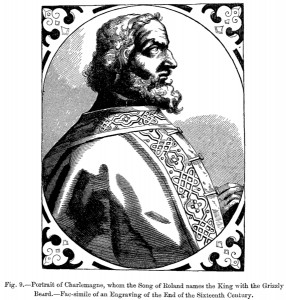 The images of enthroned Charlemagne, God’s representative on Earth, bear more connections to the icons of Christ in majesty than to modern (or antique) conceptions of portraiture. Charlemagne in later imagery (as in the Dürer portrait) is often portrayed with flowing blond hair, due to a misunderstanding of Einhard, who describes Charlemagne as having canitie pulchra, or “beautiful white hair,” which has been rendered as blond or fair in many translations. The Latin word for blond is flavus. Charlemagne wore the traditional, inconspicuous, and distinctly non-aristocratic costume of the Frankish people. He always carried a sword. On ceremonial occasions, he he wore embroidery and jewels on his clothing and shoes. He had a golden buckle for his cloak on such occasions and would appear with his great diadem, but he despised such apparel, according to Einhard, and usually dressed as did the common people. Much of what is known of Charlemagne’s life comes from his biographer, Einhard. Charlemagne was the eldest child of Pippin the Short (714 C.E. – 24 September 768 C.E., reigned from 751 C.E.) and his wife Bertrada of Laon (720 C.E. – 12 July 783 C.E. ), daughter of Caribert of Laon and Bertrada of Cologne. The reliable records name only Carloman, son of Pippin III and Gisela as his younger siblings. Later accounts, however, indicate that Redburga, wife of King Egbert of Wessex, might have been his sister (or sister-in-law or niece), and the legendary material makes him Roland’s maternal nephew through Lady Bertha. It would be folly, I think, to write a word concerning Charles’ birth and infancy, or even his boyhood, for nothing has ever been written on the subject, and there is no one alive now who can give information on it. Accordingly, I determined to pass that by as unknown, and to proceed at once to treat of his character, his deed, and such other facts of his life as are worth telling and setting forth, and shall first give an account of his deed at home and abroad, then of his character and pursuits, and lastly of his administration and death, omitting nothing worth knowing or necessary to know. Charlemagne repudiated his wife and quickly married another, a Swabian named Hildegard of Savoy. The repudiated Gerperga returned to her father’s court at Pavia. The Lombard’s wrath was now aroused and he would gladly have allied with Carloman to defeat Charles. But before war could break out, Carloman died on December 5, 771 C.E. Carloman’s wife Gerberga (often confused by contemporary historians with Charlemagne’s former wife, who probably shared her name) fled to Desiderius’ court with her sons for protection. This action is usually considered either a sign of Charlemagne’s enmity or Gerberga’s confusion. At the succession of Pope Hadrian I in 772 C.E., he demanded the return of certain cities in the former exarchate of Ravenna as in accordance with a promise of Desiderius’ succession. Desiderius instead took over certain papal cities and invaded the Pentapolis, heading for Rome. Hadrian sent embassies to Charlemagne in autumn requesting he enforce the policies of his father, Pippin. Desiderius sent his own embassies denying the pope’s charges. The embassies both met at Thionville and Charlemagne upheld the pope’s side. 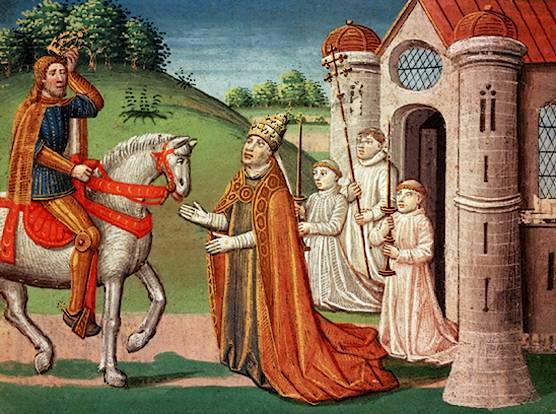 Charlemagne promptly demanded what the pope had demanded and Desiderius promptly swore never to comply. The invasion was not short in coming. Charlemagne and his uncle Bernhard, son of Charles Martel crossed the Alps in 773 C.E. and chased the Lombards back to Pavia, which they then besieged. Charlemagne temporarily left the siege to deal with Adelchis, son of Desiderius, who was raising an army at Verona. The young prince was chased to the Adriatic littoral and he fled to Constantinople to plead for assistance from Constantine V Copronymus, who was waging war with the Bulgars. The siege lasted until the spring of 774 C.E., when Charlemagne visited the pope in Rome. There he confirmed his father’s grants of land, with some later chronicles claiming—falsely—that he also expanded them, granting Tuscany, Emilia, Venice, and Corsica. The pope granted him the title patrician. He then returned to Pavia, where the Lombards were on the verge of surrendering. Charlemagne was engaged in almost constant battle throughout his reign, with his legendary sword “Joyeuse” in hand. After 30 years of war and 18 battles—the Saxon Wars—he conquered Saxonia and proceeded to convert the conquered to Roman Catholicism, using force where necessary. In his first campaign, Charlemagne forced the Engrians in 773 C.E. to submit and cut down the pagan holy tree “Irminsul” near Paderborn. The campaign was cut short by his first expedition to Italy. He returned in the year 775 C.E., marching through Westphalia and conquering the Saxon fort of Sigiburg. He then crossed Engria, where he defeated the Saxons again. Finally, in Eastphalia, he defeated a Saxon force, and its leader Hessi converted to Christianity. He returned through Westphalia, leaving encampments at Sigiburg and Eresburg, which had, up until then, been important Saxon bastions. All Saxony but Nordalbingia was under his control, but Saxon resistance had not ended. During the first peace of any substantial length (780–782 C.E. ), Charles began to appoint his sons to positions of authority within the realm, in the tradition of the kings and mayors of the past. In 780 C.E., he had disinherited his eldest son, Pippin the Hunchback, because the young man had joined a rebellion against him. 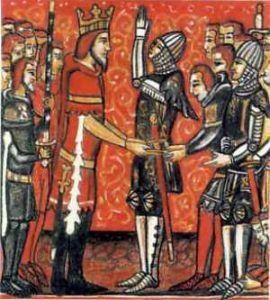 Pippin had been duped, through flattery, into joining a rebellion of nobles who pretended to despise Charles’ treatment of Himiltrude, Pippin’s mother, in 770 C.E. Charles had baptized his son (Pippin of Italy) as Pippin in order to keep the name alive in the dynasty. In 781, he made his oldest three sons each kings. The eldest, Charles, received the kingdom of Neustria, containing the regions of Anjou, Maine, and Touraine. The second eldest, Pippin, was made king of Italy, taking the Iron Crown which his father had first worn in 774 C.E. His third eldest son, Louis the Pious, became king of Aquitaine. He tried to make his sons a true Neustrian, Italian, and Aquitainian and he gave their regents some control of their sub-kingdoms, but real power was always in his hands, though he intended each to inherit their realm some day. The sons fought many wars on behalf of their father when they came of age. Charles was mostly preoccupied with the Bretons, whose border he shared and who insurrected on at least two occasions and were easily put down, but he was also sent against the Saxons on multiple occasions. In 805 C.E. and 806 C.E., he was sent into the Böhmerwald (modern Bohemia) to deal with the Slavs living there (Czechs). He subjected them to Frankish authority and devastated the valley of the Elbe, forcing a tribute on them. Pippin had to hold the Avar and Beneventan borders, but also fought the Slavs to his north. He was uniquely poised to fight the Byzantine Empire when finally that conflict arose after Charlemagne’s imperial coronation and a Venetian rebellion. Finally, Louis was in charge of the Spanish March and also went to southern Italy to fight the duke of Benevento on at least one occasion. He had taken Barcelona in a great siege in the year 797 C.E. It is difficult to understand Charlemagne’s attitude toward his daughters. None of them contracted a sacramental marriage. This may have been an attempt to control the number of potential alliances. Charlemagne certainly refused to believe the stories (mostly true) of their wild behavior. After his death the surviving daughters entered (or were forced to enter) monasteries by their own brother, the pious Louis. At least one of them, Bertha, had a recognized relationship, if not a marriage, with Angilbert, a member of Charlemagne’s court circle. In 789 C.E., in recognition of his new pagan neighbors, the Slavs, Charlemagne marched an Austrasian-Saxon army across the Elbe into Abotrite territory. The Slavs immediately submitted under their leader Witzin. He then accepted the surrender of the Wiltzes under Dragovit and demanded many hostages and the permission to send, unmolested, missionaries into the pagan region. The army marched to the Baltic before turning around and marching to the Rhine with much booty and no harassment. The tributary Slavs became loyal allies. In 795 C.E., the peace broken by the Saxons, the Abotrites and Wiltzes rose in arms with their new master against the Saxons. Witzin died in battle and Charlemagne avenged him by harrying the Eastphalians on the Elbe. Thrasuco, his successor, led his men to conquest over the Nordalbingians and handed their leaders over to Charlemagne, who greatly honored him. The Abotrites remained loyal until Charles’ death and fought later against the Danes. For the next two years, Charles was occupied with the Slavs against the Saxons. Pippin and Duke Eric of Friuli continued, however, to assault the Avars’ ring-shaped strongholds. The great Ring of the Avars, their capital fortress, was taken twice. The booty was sent to Charlemagne at his capital, Aachen, and redistributed to all his followers and even to foreign rulers, including King Offa of Mercia. Soon the Avar tuduns (chiefs) had surrendered, and traveled to Aachen to subject themselves to Charlemagne as vassals and Christians. This Charlemagne accepted and sent one native chief, baptized Abraham, back to Avaria with the ancient title of khagan. Abraham kept his people in line, but soon the Magyars had swept the Avars away and presented a new threat to Charlemagne’s descendants. The conquest of Italy brought Charlemagne in contact with the Saracens who, at the time, controlled the Mediterranean. Pippin, his son, was much occupied with Saracens in Italy. Charlemagne conquered Corsica and Sardinia at an unknown date and in 799 C.E.the Balearic Islands. The islands were often attacked by Saracen pirates, but the counts of Genoa and Tuscany (Boniface of Tuscany) kept them at a safe distance with large fleets until the end of Charlemagne’s reign. Charlemagne even had contact with the caliphal court in Baghdad. In 797 C.E. (or possibly 801 C.E. ), the caliph of Baghdad, Harun al-Rashid, presented Charlemagne with an Asian elephant named Abul-Abbas and a mechanical clock, out of which came a mechanical bird to announce the hours. In Hispania, the struggle against the Moors continued unabated throughout the latter half of his reign. His son Louis was in charge of the Spanish border. In 785 C.E., his men captured Gerona permanently and extended Frankish control into the Catalan littoral for the duration of Charlemagne’s reign (and much longer, it remained nominally Frankish until the Treaty of Corbeil in 1258). The Muslim chiefs in the northeast of Spain were constantly revolting against Cordoban authority and they often turned to the Franks for help. The Frankish border was slowly extended until 795 C.E., when Gerona, Cardona, Ausona, and Urgel were united into the new Spanish March, within the old duchy of Septimania. The iconoclasm of the Isaurian Dynasty and resulting religious conflicts with the Empress Irene, sitting on the throne in Constantinople in 800 C.E., were probably the chief causes of Pope Leo’s desire to formally resurrect the Roman imperial title in the West. He also most certainly desired to increase the influence of the papacy, to honor Charlemagne, who had saved him, and to solve the constitutional issues then most troubling to European jurists in an era when Rome was not in the hands of an emperor. Thus, Charlemagne’s assumption of the title of Caesar Augustus, Constantine, and Justinian was not an usurpation in the eyes of the Franks or Italians. However, in Greece it was strongly protested by Empress Irene and the usurper Nicephorus I, neither of whom had any great effect in enforcing their protests. The Byzantines, however, still held several territories in Italy: Venice (what was left of the exarchate of Ravenna), Reggio (Calabria, the toe), Brindisi (Apulia, the heel), and Naples (the Ducatus Neapolitanus). These regions remained outside of Frankish hands until 804 C.E., when the Venetians, torn by infighting, transferred their allegiance to the Iron Crown of Pippin, Charles’ son. The Pax Nicephori ended. Nicephorus ravaged the coasts with a fleet and the only instance of war between Constantinople and Aachen, as it was, began. It lasted until 810, when the pro-Byzantine party in Venice gave their city back to the emperor in Byzantium and the two emperors of Europe made peace. Charlemagne received the Istrian peninsula and in 812 C.E. Emperor Michael I Rhangabes recognised his title. After the conquest of Nordalbingia, the Frankish frontier was brought into contact with Scandinavia. The pagan Danes, “a race almost unknown to his ancestors, but destined to be only too well known to his sons,” as British military historian Charles Oman eloquently described them, inhabiting the Jutland peninsula had heard many stories from Widukind and his allies who had taken refuge with them about the dangers of the Franks and the fury which their Christian king could direct against pagan neighbors. In 808 C.E., the king of the Danes, Godfred, built the vast Danevirke across the isthmus of Schleswig. This defense, (later employed in the Danish-Prussian War of 1864 C.E. ), was at its beginning a 30 km-long-earthenwork rampart. The Danevirke protected Danish land and gave Godfred the opportunity to harass Frisia and Flanders with pirate raids. He also subdued the Frank-allied Wiltzes and fought the Abotrites. He invaded Frisia and joked of visiting Aachen, but was murdered before he could do any more, either by a Frankish assassin or by one of his own men. Godfred was succeeded by his nephew Hemming, who concluded a peace with Charlemagne in late 811 C.E. He died January twenty-eighth, the seventh day from the time that he took to his bed, at nine o’clock in the morning, after partaking of the holy communion, in the seventy-second year of his age and the forty-seventh of his reign. 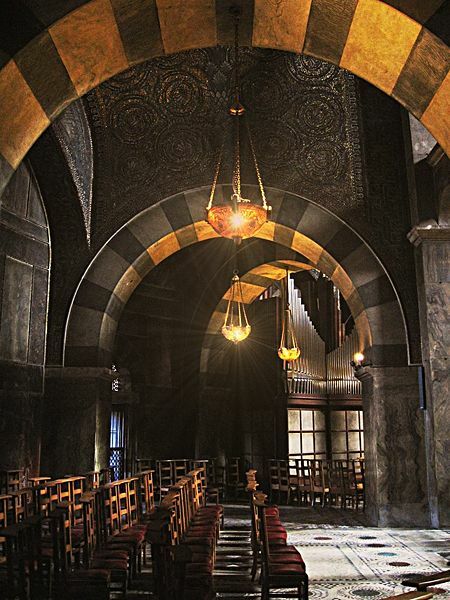 When Charlemagne died in 814, he was buried in his own Cathedral at Aachen. He was succeeded by his only son then surviving, Louis the Pious. His empire lasted only another generation in its entirety; its division, according to custom, between Louis’s own sons after their father’s death, laid the foundation for the modern states of France and Germany. Pursuing his father’s reforms, Charlemagne did away with the monetary system based on the gold sou. Both he and the Anglo-Saxon King Offa of Mercia took up the system set in place by Pippin. He set up a new standard, the livre (from the Latin libra, the modern pound)—a unit of both money and weight—which was worth 20 sous (from the Latin solidus, the modern shilling) or 240 deniers (from the Latin denarius, the modern penny). During this period, the livre and the sou were counting units, only the denier was a coin of the realm. Charlemagne applied this system to much of the European continent, and Offa’s standard was voluntarily adopted by much of England. After Charlemagne’s death, continental coinage degraded and most of Europe resorted to using the continued high quality English coin until about 1100. A part of Charlemagne’s success as warrior and administrator can be traced to his admiration for learning. His reign and the era it ushered in are often referred to as the Renaissance because of the flowering of scholarship, literature, art, and architecture that characterize it. 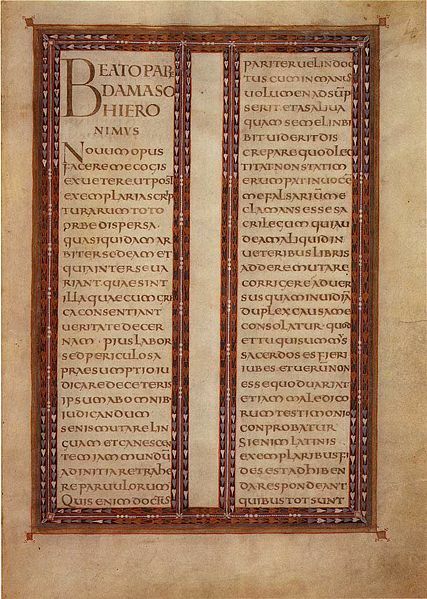 Most of the surviving works of classical Latin were copied and preserved by Carolingian scholars. 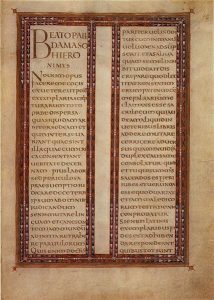 Indeed, the earliest manuscripts available for many ancient texts are Carolingian. It is almost certain that a text which survived to the Carolingian age survives still. The pan-European nature of Charlemagne’s influence is indicated by the origins of many of the men who worked for him: Alcuin, an Anglo-Saxons from York; Theodulf, a Visigoth, probably from Septimania; Paul the Deacon, a Lombard; and Angilbert and Einhard, Charlemagne’s biographer, who were Franks. Charlemagne took a serious interest in his and others’ scholarship and had learned to read in his adulthood, although he never quite learned how to write, he used to keep a slate and stylus underneath his pillow, according to Einhard. His handwriting was bad, from which grew the legend that he could not write. Even learning to read was quite an achievement for kings at this time, most of whom were illiterate. During Charles’ reign, the Roman half uncial script and its cursive version, which had given rise to various continental minuscule scripts, combined with features from the insular scripts that were being used in Irish and English monasteries. 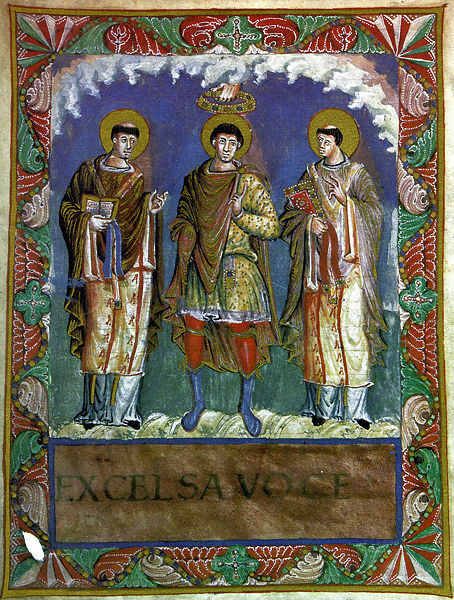 Carolingian minuscule was created partly under the patronage of Charlemagne. Alcuin of York, who ran the palace school and scriptorium at Aachen, was probably a chief influence in this. 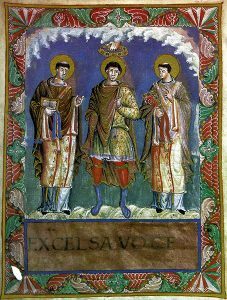 The revolutionary character of the Carolingian reform, however, can be over-emphasized; efforts at taming the crabbed Merovingian and Germanic hands had been underway before Alcuin arrived at Aachen. The new minuscule was disseminated first from Aachen, and later from the influential scriptorium at Tours, where Alcuin retired as an abbot. 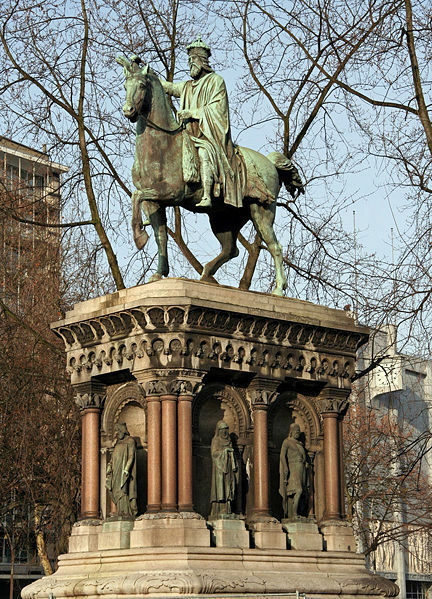 In the first year of his reign, Charlemagne went to Aachen (in French, Aix-la-Chapelle) for the first time. He began to build a palace 20 years later (788 C.E.). The palace chapel, constructed in 796 C.E., later became Aachen Cathedral. Charlemagne spent most winters between 800 and his death (814 C.E.) at Aachen, which he made the joint capital with Rome, in order to enjoy the hot springs. Charlemagne organized his empire into 350 counties, each led by an appointed count. Counts served as judges, administrators, and enforcers of capitularies. To enforce loyalty, he set up the system of missi dominici, meaning “envoys of the lord.” In this system, one representative of the church and one representative of the emperor would head to the different counties every year and report back to Charlemagne on their status. 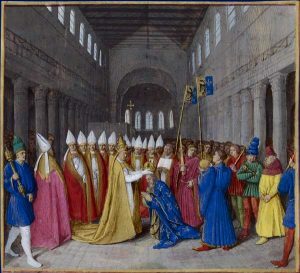 Historians have debated for centuries whether Charlemagne was aware of the Pope’s intent to crown him Emperor prior to the coronation itself (Charlemagne declared that he would not have entered Saint Peter’s had he known), but that debate has often obscured the more significant question of why Pope Leo granted the title and why Charlemagne chose to accept it once he did. Roger Collins points out  “that the motivation behind the acceptance of the imperial title was a romantic and antiquarian interest in reviving the Roman empire is highly unlikely.” For one thing, such romance would not have appealed either to Franks or Roman Catholics at the turn of the ninth century, both of whom viewed the Classical heritage of the Roman Empire with distrust. The Franks took pride in having “fought against and thrown from their shoulders the heavy yoke of the Romans” and “from the knowledge gained in baptism, clothed in gold and precious stones the bodies of the holy martyrs whom the Romans had killed by fire, by the sword and by wild animals,” as Pippin III described it in a law of 763 C.E. or 764 C.E.. Furthermore, the new title—carrying with it the risk that the new emperor would “make drastic changes to the traditional styles and procedures of government” or “concentrate his attentions on Italy or on Mediterranean concerns more generally” —risked alienating the Frankish leadership. With Charlemagne’s coronation, therefore, “the Roman Empire remained, so far as either of them [Charlemagne and Leo] were concerned, one and indivisible, with Charles as its Emperor,” though there can have been “little doubt that the coronation, with all that it implied, would be furiously contested in Constantinople.”  How realistic either Charlemagne or the Pope felt it to be that the people of Constantinople would ever accept the King of the Franks as their Emperor, we cannot know; Alcuin speaks hopefully in his letters of an Imperium Christianum (“Christian Empire”), wherein, “just as the inhabitants of the [Roman Empire] had been united by a common Roman citizenship,” presumably this new empire would be united by a common Christian faith , certainly this is the view of Pirenne when he says “Charles was the Emperor of the ecclesia as the Pope conceived it, of the Roman Church, regarded as the universal Church” . What we do know, from the Byzantine chronicler Theophanes , is that Charlemagne’s reaction to his coronation was to take the initial steps toward securing the Constantinopolitan throne by sending envoys of marriage to Irene, and that Irene reacted somewhat favorably to them. Only when the people of Constantinople reacted to Irene’s failure to immediately rebuff the proposal by deposing her and replacing her with one of her ministers, Nicephorus I, did Charlemagne drop any ambitions toward the Byzantine throne and begin minimizing his new Imperial title, and instead return to describing himself primarily as rex Francorum et Langobardum. The title of emperor remained in his family for years to come, however, as brothers fought over who had the supremacy in the Frankish state. 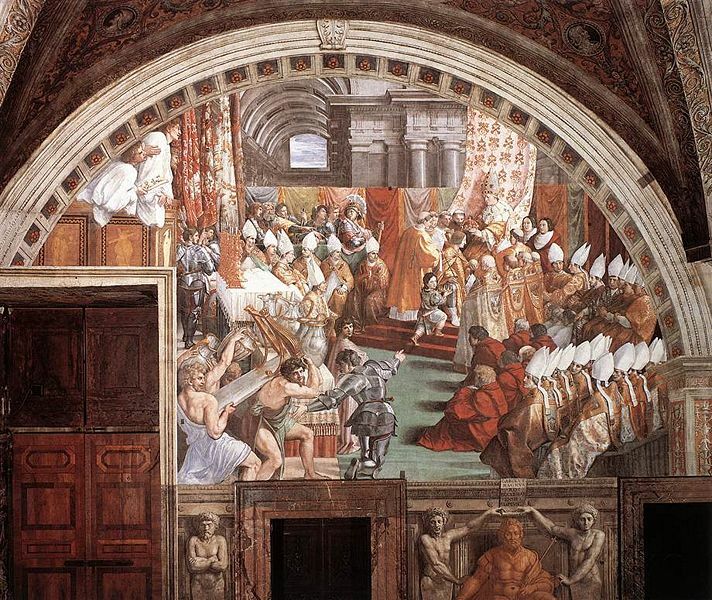 The papacy itself never forgot the title nor abandoned the right to bestow it. When the family of Charles ceased to produce worthy heirs, the pope gladly crowned whichever Italian magnate could best protect him from his local enemies. This devolution led, as could have been expected, to the dormancy of the title for almost 40 years (924-962 C.E.). 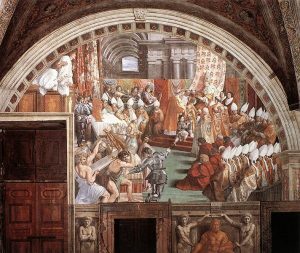 Finally, in 962 C.E., in a radically different Europe from Charlemagne’s, a new Roman Emperor was crowned in Rome by a grateful pope. This emperor, Otto the Great, brought the title into the hands the kings of Germany for almost a millennium, for it was to become the Holy Roman Empire, a true imperial successor to Charles, if not Augustus. In 806 C.E., Charlemagne first made provision for the traditional division of the empire upon his death. For Charles the Younger he designated the imperial title, Austrasia and Neustria, Saxony, Burgundy, and Thuringia. To Pippin he gave Italy, Bavaria, and Swabia. Louis received Aquitaine, the Spanish March, and Provence. This division might have worked, but it was never to be tested. Pippin died in 810 C.E. and Charles in 811 C.E. 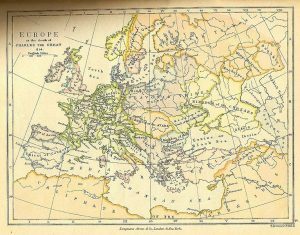 Charlemagne redrew the map of Europe by giving all to Louis, save the Iron Crown, which went to Pippin’s (illegitimate) son Bernard of Italy. There was no mention of the imperial title however, which has led to the suggestion that Charlemagne regarded the title as an honorary achievement which held no hereditary significance. Charlemagne, being a model knight as one of the Nine Worthies, enjoyed an important afterlife in European culture. One of the great medieval literary cycles, the Charlemagne cycle or the Matter of France, centers around the deeds of Charlemagne and his historical commander of the border with Brittany, Roland, and the paladins who are analogous to the knights of the Round Table or King Arthur’s court. Their tales constitute the first chansons de geste. Charlemagne is depicted as the champion of Christendom against Muslims and pagans. Charlemagne also dealt diplomatically with Muslims, exchanging ambassadors with Harun al-Rashid and negotiating some degree of responsibility for the welfare of Christians and Christian sites in Palestine. Charlemagne himself was accorded sainthood inside the Holy Roman Empire after the twelfth century. His canonization by Antipope Paschal III, to gain the favor of Frederick Barbarossa in 1165, was never recognized by the Holy See, which annulled all of Paschal’s ordinances at the Third Lateran Council in 1179. It is frequently claimed by genealogists that all people with European ancestry alive today are probably descended from Charlemagne. However, only a small percentage can actually prove descent from him. Charlemagne’s marriage and relationship politics and ethics did, however, result in a fairly large number of descendants, all of whom had far better life expectancies than is usually the case for children in that time period. They were married into houses of nobility and as a result of intermarriages many people of noble descent can indeed trace their ancestry back to Charlemagne. He is without a doubt an ancestor of every royal family of Europe. His name in English, Charlemagne, is identical to the French language from, which in turn comes from the Latin. The French translation of Charles the Great is Charles le Grand, which is used. 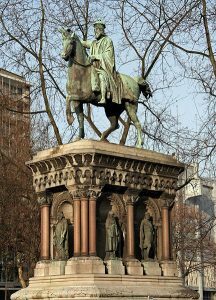 In German, he is called Karl der Große or Karl der Grosse, which means Charles the Great; likewise in Dutch, Karel de Grote. 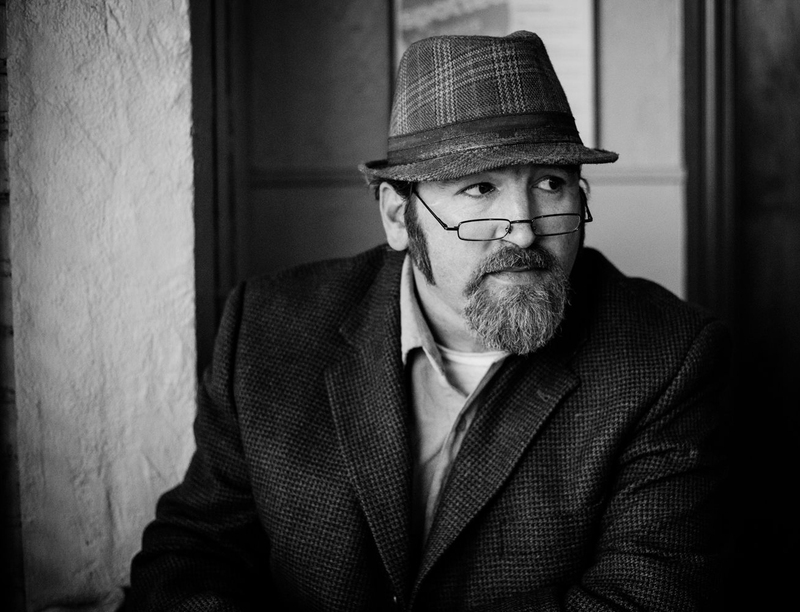 His name in other Romance languages, like Italian and Spanish language Carlomagno, is derived from the Latin. In other Germanic and Slavic languages, it is usually a translation of Charles the Great (Carolus Magnus). Many of the Slavic languages took their word for king from the German name for Charlemagne, Karl: Czech král, South Slavic (such as Slovenian or Serbo-Croatian) kralj, Polish król, etc. Edward Gibbon. The Decline and Fall of the Roman Empire. Hans Friedrich Mueller (ed). (Random House, 2003), 888. Indeed, Gibbon regards the kingdoms of France and Germany as preexisting though integrated. It is their separation under the Carolingians that is of historic importance. Charles Oman. The Dark Ages 476–919. (Rivingtons: London, 1914) Regards Charlemagne’s grandsons as the first kings of France and Germany, which at the time comprised the whole of the Carolingian Empire save Italy. The Online Medieval and Classical Library  Song of Roland. Retrieved December 26, 2007. J. Michael Gainor  Papacy Uncovered website, “The Donation of Constantine.” Retrieved December 26, 2007. Einhard. The Life of Charlemagne. Medieval Sourcebook online: . Retrieved December 26, 2007. Paul Halsall, Medieval Sourcebook: The Donation of Constantine (c.750-800) Retrieved December 26, 2007. __________. Early Medieval Europe, 300-1000, Second Edition (Palgrave History of Europe) Palgrave Macmillan, 1999. __________. 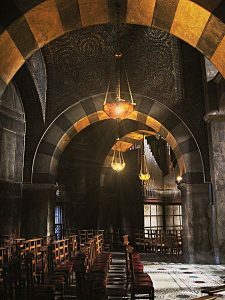 Byzantium: The Early Centuries. New York: Knopf, (1st American edition) 1989. This entry was posted in Charlemagne, Franks, Gauls, History, Medieval, Middle Ages. Bookmark the permalink.